We leave olive country. 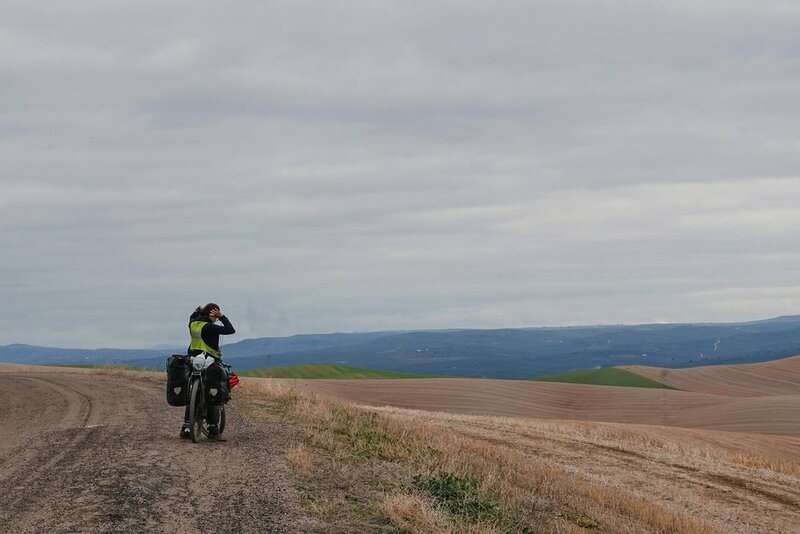 We ride through a strange, bald landscape of rolling hills and few trees. We use Google Maps for our route planning today, which is always something of a gamble. It takes us across goat trails and private access roads and train tracks and dead ends. It is unpredictable yet fun. Ordinarily we wouldn't have time for Google Maps and its unreliable detours. But we don't have very far to go today. 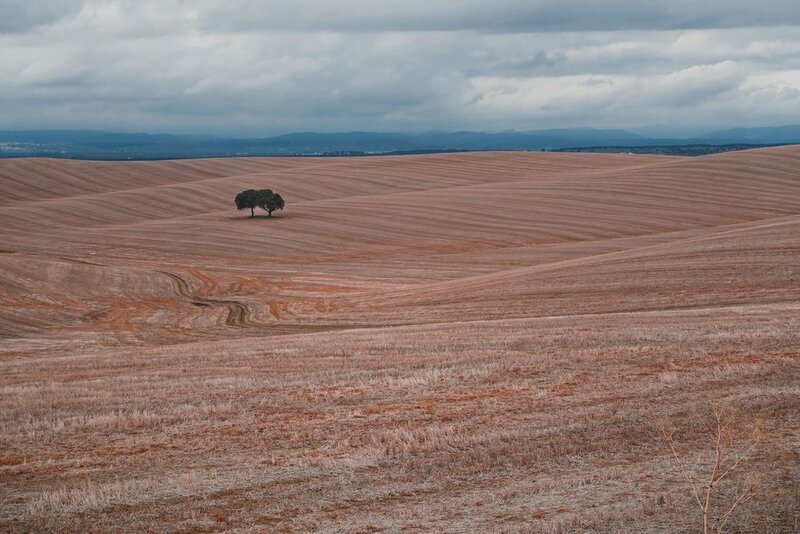 Just forty or fifty kilometers to Linares. After months and months of spontaneous sleeping arrangements, we have begun to better prepare. We have dusted off our Warmshowers and Couchsurfing profiles and sent out some messages. Hey, we're heading through Spain on our bikes. Are you around? We had a terrific experience with Eladio, our first Warmshowers host in Europe, and now we're headed to the home of James, whom we've met through Couchsurfing. He's a young Brit teaching English in Spain for a year, and he's welcomed us to surf on his couch for a night. It's not just any night, either. It's the night before El Día de los Tres Reyes Magos. Three Kings' Day. Three Kings' Day is something like a second Christmas in Spain. Proper Christmas, the twenty-fifth of December, is for the family. Big meals, gatherings, maybe a gift or two for the children. But Tres Reyes, the sixth of January, is all about the kids. It's the day the three kings come bearing regalos. Presents. 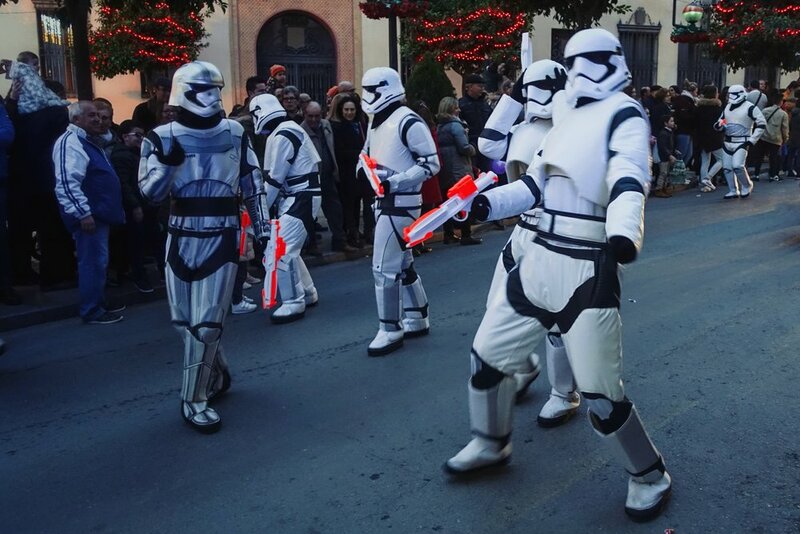 The night before Three Kings' Day, every last town in Spain holds a parade to welcome the three kings. So we didn't need to be in Linares tonight to catch the parade. We just needed to be in a town. Linares, population forty thousand, seemed like a good bet. So here we are. Anyway. James. We meet him and his friend Esther outside El Corte Ingles. I make the mistake of thinking his friend Esther is from Spain, or at the very least has been in Spain for longer than a few days and is familiar with the customary Spanish greeting of besitos that everyone gives to everyone else: one kiss on the right cheek followed by one kiss on the left. I am halfway through the first besito before I realize that Esther has no idea what is happening or why this stranger is kissing her face. Her eyes are wide as saucers. We both freeze, pause for far too many moments, engage in the most awkward half-hug of my life, and separate without looking at one another. Lauren and James are a few feet away, staring. Lauren is doing her best to suppress her laughter. Her best is not very good at all. It turns out Esther is not from Spain, and only arrived for a brief visit to see James a few days earlier. Ella no conoce besitos. The parade is a blast. There are thousands of participants and tens of thousands of spectators. The participants are dressed in all kinds of costumes: Minions and Storm Troopers and emojis and elves. They dance down the street or ride atop grand, elaborate floats. They toss candy into the crowd. Candy is the big draw here. The parade features a lot of it. The Three Kings' Parade is a little like the Halloween we celebrate in America, except instead of kids walking door to door and collecting sweets, they stand in one place and sweets are thrown at their faces. They endure the barrage of small candies pelted in their general direction, pick them up once they've hit the ground, and place them proudly in their bags or pillowcases. The more entrepreneurial among them come to the parade with umbrellas. They open the umbrella, turn it upside-down, and hold it above their heads as a great big net. Okay candy, come to me. The folks on the floats love this, and these kids make off the best without working very hard at all. We meet a few more of James's friends after the parade. We have a great time with everyone (even Esther; her and I seem to have come to an unspoken agreement to just pretend the whole besitos thing never happened). We stay up late and get a lot of tapas and sleep well. While we slumber, the three kings climb up into the windows of all the little children in Spain and leave them presents to find in the morning. The only thing we find the next morning is rain. Buckets of it pouring down outside the window. We thank James and I wave goodbye to Esther from far across the room. We put on our rain gear and wade into the deluge. It is raining and we are damp. It is pouring and we are soaked. And yet, we still haven't found new gloves. We're still wearing these terribly, flimsy little things that claim to be waterproof but instead let water in through the seams and just trap it there, saturated fabric clinging to the skin. I look down as I ride and wonder why anyone would even put seams on waterproof gloves. You had one job. Don't get wet. Everything is. We are twenty-five kilometers from Linares headed for our next mountain ridge. The sky ahead is even greyer than the sky behind. Water has gotten into our rain gear and we're trembling in the cold. We pull over. "What the hell are we doing?" Lauren asks. "Why are we here?" Seriously, though. Why are we here? 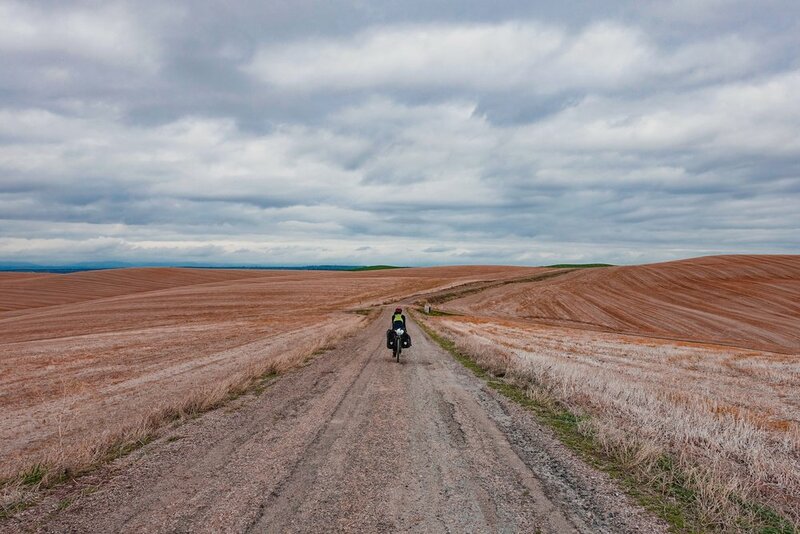 We are riding through the frigid interior of Spain in January in order to reach the warm, sunny coast. At which point we will take a train to Barcelona, skipping all of the warm-sunny-coast bits. We're headed to another Vía Verde right now. We already know this Vía Verde is unpaved. Which means, in this rain, it'll be mud. Hundreds of kilometers of squelching mud underneath our tires. Like the slow revolution of chain on cassette after shifting gears, everything just clicks into place. A lower, more enjoyable gear to pedal in. It doesn't have to be this hard. We can take a train to Valencia and ride the rest of the way to Barcelona from there. In spite of the cold and the rain and the puddles now forming inside our shoes, we are suddenly elated. My mind floods with images of us lying on a warm beach, bikes in the sand. I can almost feel the promise of sun on my numb, sopping skin. It all sinks in like the precipitation presently soaking into my base layers. We'll be in Valencia tonight! We need to get to a train station. There are many differences between traveling on a bicycle and traveling in a car. Here's one. You are between two towns. Down the hill is Linares, about twenty kilometers whence you came. Up the hill is Arquillos, much closer. You're pretty certain Linares has a train station, but maybe Arquillos does too. If so, it'd make more sense to just continue a few more kilometers up the hill. So you need to know two things. Principally, does Arquillos have a train station? And next, does that train station service Valencia-bound trains? Both questions can be easily answered with a modern cell phone. In a car, you pull out your cell phone and tap a few screens. You got the information you need. You put the vehicle in drive, and speed off in the direction of the nearest station. You turn up the heat a little bit, because it's damn cold out, and turn your windshield wipers to high, because it's raining cats and dogs. On a bicycle, you cannot pull out your cell phone, on account of the cats and dogs. Your hands are too wet to work the touch screen anyway. You think maybe you can put your phone inside your raincoat and make a dry little shelter around it, but when you peer down your hood channels water into the cavity like a miniature cascade. The screen grows wet and you have nothing to dry it on, because every item of clothing you're wearing falls somewhere on the continuum between damp and fully saturated. You scan the horizon for something—anything—that can provide about a small fraction of a square meter of cover for just a few moments. There is nothing. And so you and your partner argue on the side of the road in the rain for fifteen minutes about in which direction the nearest cover is to be found. One of you shouts that there was an overpass ten kilometers back that was dry. The other contends that while they remember the overpass well and it was indeed dry underneath it, they're not going ten kilometers back down a hill for a little bit of cover when there's a full-fledged town just five kilometers up the hill. You bicker back and forth about knowns and unknowns, all the while getting wetter and colder. You continue up the hill a few hundred meters. One of you gets off the bike and demands the tent. One of you is going to wrap themselves in the rain fly and figure this all out dressed like a waterproof Halloween ghost on the side of the road. The other says no way are they getting the presently-dry tent soaking wet for just a minute or two of shelter. They say that thing will never dry in this weather. You bicker back and forth about who's going to carry the wet tent, all the while getting wetter and colder. One of you unpacks the tent and climbs under the rainfly and can barely operate your phone on account of all the condensation. Together you discover that there is no train station in Arquillos, which answers one question, but also that there are no Valencia-bound trains leaving Linares for days, which presents a half-dozen more. You discuss what to do, and you disagree about what to do, and your emotions are high and wild because this is no place to be having a thoughtful, rational discussion. You bicker back and forth about who's right and who's wrong. You're no longer getting wetter, because your clothes have now reached their saturation point. Now you're just getting colder. A calm, happy couple traveling in a car passes a two-headed waterproof Halloween ghost on the side of the road and splashes water onto it. The calm, happy couple in the car, faces illuminated by the soft blue glow of a phone screen, appear to know just where they're going. We reach Arquillos. It's small, but big enough that you might expect a cafe or a restaurant to be open. Somewhere to dry off in and take a breather. And on any other day of the year, you might be right. Happy Three Kings' Day, where every last Spaniard is home celebrating with their kids and every last business is shuttered 'til Monday. Almost. There's a gas station on the other end of town where an attendant informs us that no, there are no trains here, and no, there are also no buses running, and no, hitching isn't likely to work because truckers aren't driving on Three Kings' Day, and oh, by the way, tomorrow is Sunday and you're not likely to find anyone either. She checks her phone and determines that even if we were to make it to a bus station, bus tickets are sold out for the following several days. Folks must be returning to work after the holidays or something. We are shivering. The small shop in the gas station is not heated, and we're not exactly extended an invitation to hang around and dry off anyway. At this point, I figure I'm better off wearing no gloves than wet gloves, and grab hold of my handlebars with bare, numb hands. This is the worst. Of all our rough days on the bikes these past six months, this is the very worst one. Most days bikes are liberating. To be on a bike is to feel like a bird. I can go anywhere. Today, to be on a bike is to feel like a chicken. I can flutter around for a few feet, but I'm not going to make it very far. We just don't know what to do. The temperature is almost freezing, and sure to hit the freezing point by sundown. Tomorrow will be colder, and the next day colder still. There doesn't seem to be a way out of this except on our bikes. We will be stuck here until we pedal ourselves somewhere better. We are not going to make it to Valencia today. So we continue on by bike. Trembling as we pedal, we climb higher into the Sierra. The temperature drops. Water sloshes in my shoes and my teeth are chattering. I can't feel my fingers, and thus I cannot brake, but that's just fine because we're going up an endless hill. There's no need to brake. I catch up to Lauren cycling ahead. Her bike is making an awful screeching noise. Like metal on metal. "Your bike isn't sounding so good," I say through shivers. "It isn't riding so good, either," she says. We stop to inspect the bike. There's a ton of resistance on the wheel, and something clearly isn't turning the way it's supposed to be. But there's nothing we can do right now. 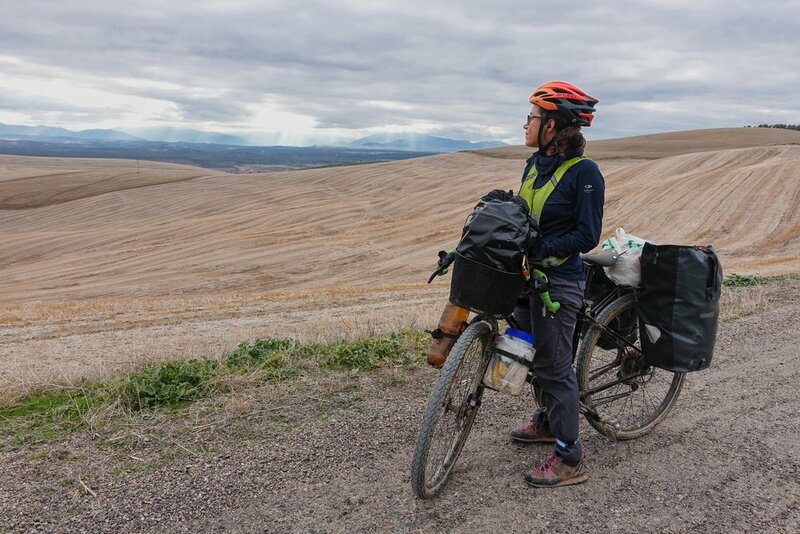 Our hands are too frozen to unbuckle our panniers or get out our bike tools, and they're definitely too frozen to begin making fine adjustments in hard-to-reach places. We ride on. A few kilometers later, Lauren's tire starts to go flat. This is the worst, Lauren says. This really is the worst, I agree. We stare at each other as the sky dumps heavy, icy mush on our faces.